The Bears strong spring sports showing included a state academic championship for the boys soccer team, which posted an average GPA of 3.6. Battle-tested giant killers. That’s certainly a label that accurately sums up the Olympia High School boys soccer program the past two seasons as the Bears have turned into the team no one wants to play in the postseason. Last year Olympia defeated Auburn to claim the 4A West Central/Southwest District’s No. 15 seed. The Bears’ reward for the win was a match against North Puget Sound League champion and top-seeded Kentwood. The Bears won, stunning the Conquerors in a 2-0 shutout. To prove it wasn’t a fluke, Olympia followed up that triumph by besting 4A Greater Saint Helens League champion Camas in overtime to secure the district’s No. 1 seed into the state tournament. Khalil Bredeson, a three-year starter for the Bears, will play next year at The Evergreen State College. It’s been more of the same this year with the Bears securing their second consecutive Class 4A state tournament berth after defeating Federal Way, the No. 2 seed out of the NPSL, and Union, the runner-up of the GSHL. After their remarkable run through the district tournament last year, the Bears fell in the first round of state, losing to Kamiak, 4-0. Bredeson, who will play soccer at The Evergreen State College next year, is one of four seniors on the team. He is joined by fellow captain Mitchell Nee, Zack Pittelkau and Ian Taylor. One major reason the Bears are able to seamlessly shift from the regular season to the postseason without losing any intensity is because of the league they play in. 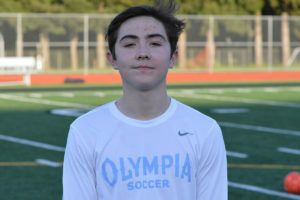 Olympia finished fourth in the 4A SPSL this year with a record of 8-6-2. Of the remaining 16 teams in the state tournament, 25 percent come from the league. In addition to Sumner, Puyallup, which shared the regular season league title with Sumner, plays at Skyview in the first round, while South Kitsap, the league’s fifth-place team, hosts Mount Vernon in the opening round. 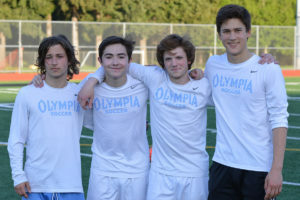 Olympia (10-6-2) entered state this year as the district’s No. 5 seed, and opened state tournament play on the road May 15 when they traveled to Glacier Peak High School in Snohomish to take on the Grizzlies at 6:00 p.m. This time around they faced a veteran squad in Glacier Peak, which finished third at the state tournament in 2017. Senior forward Keegan Rubio scored two goals, helping the Grizzlies (12-3-1) earn their fourth consecutive state berth with a 3-0 victory over Mount Vernon in the 4A District 1 tournament championship. 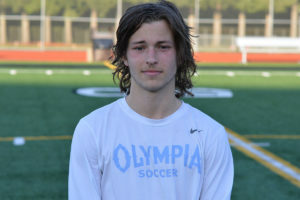 Despite their best efforts, the Olympia High School boys soccer team saw its season come to an end on May 15 after losing to Glacier Peak, 2-0, in the first round of the Class 4A state playoffs. 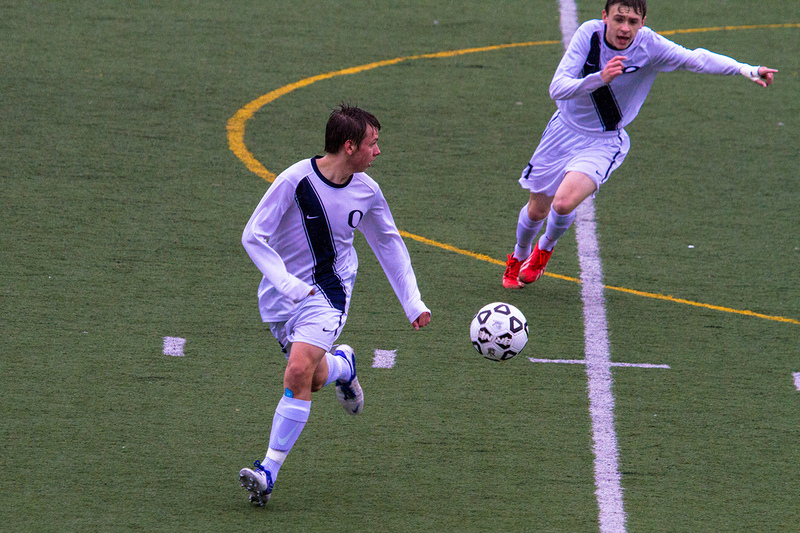 It marked the second consecutive season the Bears (10-7-3) lost to a Wesco 4A team in the opening round at state. After a scoreless first half, the Grizzlies (13-3-1) got on the scoreboard when senior Keegan Rubio headed in a goal in the 52nd minute. 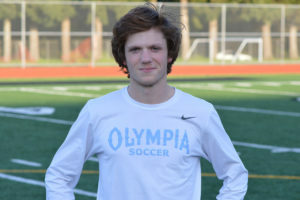 The Olympia was unable to find the equalizer before Glacier Peak sealed the contest by adding its second goal in the 72nd minute.